Soldering is a very handy skill to have in the RC hobby. Sooner or later, you’ll find yourself with a need to solder something. This is especially true if you’re into electric-powered vehicles. One of the more common (and dangerous) of these jobs is soldering power connectors to a battery. There is a lot of potential energy at hand. A poorly executed approach can ruin your battery, start a fire, or even injure you. Despite the risks, this job is nothing to be afraid of as long as you know what to watch for. 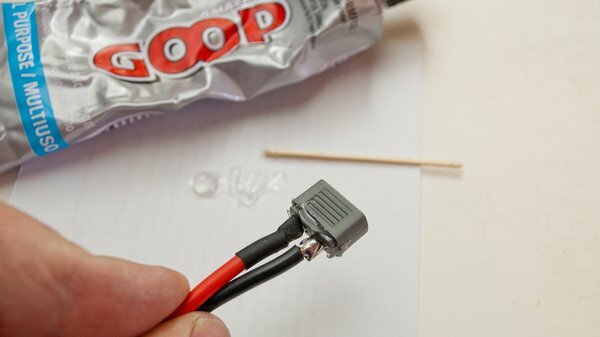 Today, I’ll illustrate how I mitigate the risks of soldering battery connectors using simple tools and a conservative approach. 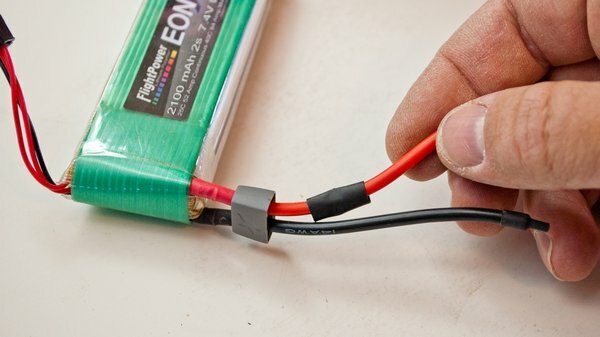 Soldering connectors to RC batteries is simple, but it can be dangerous if you do not take the appropriate precautions. 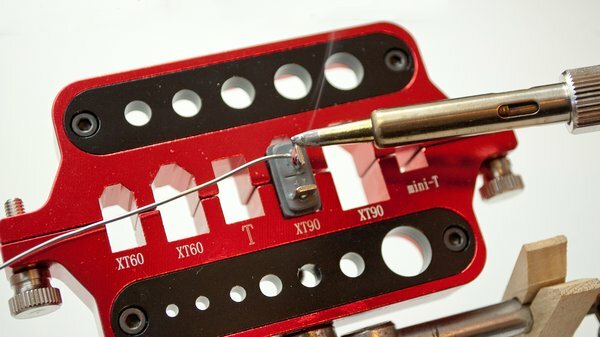 To be clear, this article does not cover the basics of electrical soldering. You’ll want to be confident in your soldering skills before working with batteries. There are lots of online tutorials that can help you get to that point. The biggest danger when soldering battery connectors is accidentally creating an electrical short. 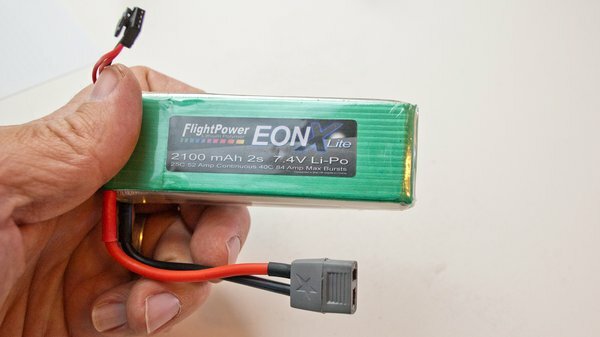 Of all the different batteries used by hobbyists, LiPo cells pose the biggest risk when shorted. They are very energy-dense and also intolerant of abuse. Even a brief, incidental short can cause a big reaction and inflict permanent damage. Just brushing a metal tool across two exposed contacts is all it takes. Most of the effort involved with soldering batteries is dedicated to preventing that dreaded short. The actual soldering task is usually no big deal. In my example, I will be attaching a Hobbico Star Plug to a 2-cell LiPo. 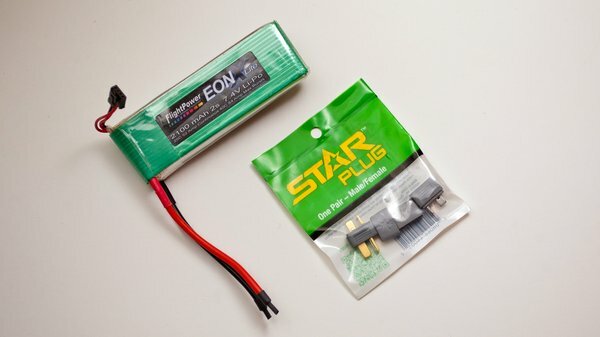 The Star Plug is currently my preferred connector. It is compatible with the Deans Ultra Plugs that I have on all of my legacy hardware, but the Star Plug has a large, textured gripping surface that makes it easier to manipulate with cold or sweaty hands. The Star Plug requires extra attention when soldering, so it’s a good example to use here. Start off by making sure that the battery leads are already well insulated. If your battery is sold without a connector, it probably has heatshrink tubing or tape over the ends of the wires. 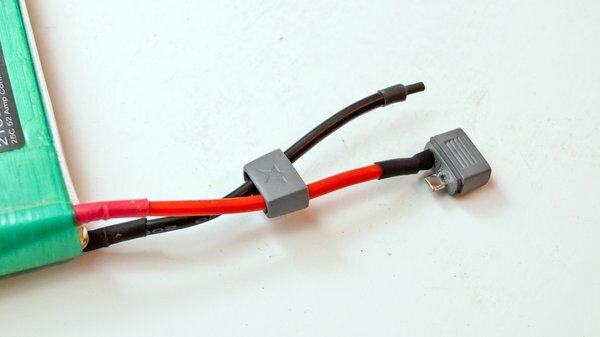 If you have to remove an existing connector from the battery, cut just one wire at a time. Insulate that wire before cutting the next wire. Use the same approach if you’re unsoldering the old connector rather than cutting the wires. Expose and remove just one wire at a time. Before connecting any wires, you should tin one battery lead and the connector. This aluminum jig holds the connector firmly and acts as a heatsink. Strip about 3/16″ of insulation from one of the battery wires (seriously…only one). Tin the exposed wire thoroughly. I like to secure the wire with a 3rd-Hand tool while I’m tinning. The tool’s alligator clip holds things in place and also acts as a heatsink. You should also tin the solder pads of the battery connector at this point. Make sure that you install the female connector to the battery. You may tin both the positive and negative pads at once. Just make sure that you’re using a soldering iron with sufficient power to do the job quickly. The minimum is probably about 40-watts. I typically use an adjustable 75-watt iron with a wedge tip. When I solder Ultra Plugs, I tin the outside surface of the positive solder pad in order to keep the maximum working distance from the negative terminal. The Star Plug, however, has a snap-on cover that surrounds the solder pads. Whenever I try to connect any wire larger than about 18-gauge to the outside of the positive tab, it interferes with the fit of the cover. You could just ditch the plastic cover and insulate both solder joints with heatshrink tubing. But the cover provides a lot of the gripping surface that makes Star Plugs easy to use. So I solder wires to the inside surface of the pad. Don’t forget to preinstall the heatshrink tubing and the snap-on cover that will protect and insulate your solder joints. 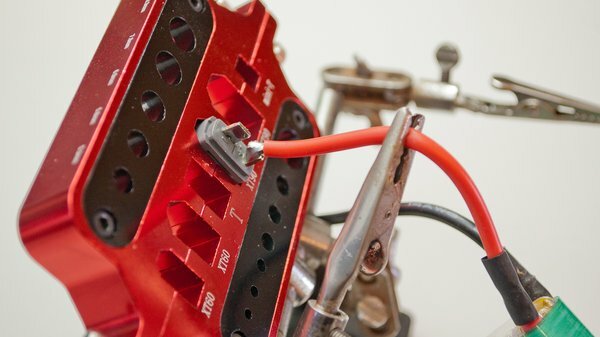 I recently purchased an aluminum jig that is designed specifically for use when soldering some of the more popular RC battery connectors, including Ultra Plugs (aka “T-plugs” because of their perpendicular contacts). The Star Plug’s larger girth prevents it from fitting in the jig’s T-plug slot, but it is a nice fit in the XT-90 slot. The jig holds the plug tightly and also helps to pull away heat. Some people like to insert a male plug into the female side to keep the contacts aligned while soldering. Unless you’ve insulated the solder pads of the male plug, the exposed contacts could pose a big risk of shorting the battery. I prefer to use the aluminum jig and work quickly to avoid excess heat that could soften the plastic connector housing. You must remember to slide the snap-on cover over the battery wires before making your first connection. There’s nothing worse than having to unsolder a perfect, shiny solder joint because you forgot the cover. With this first wire, I also add a short length of 3/16″-diameter heatshrink tubing. The reason for this will soon become obvious. Be sure to slide the cover and the tubing far away from the exposed part of the wire to prevent them from being affected by conducted heat. I have my plug jig mounted to a 3rd-hand tool. The tool’s alligator clips are useful for holding the wire against the plug during soldering. Now it’s time to connect your tinned battery wire to the Star Plug. Pay attention to the polarity markings to ensure that you connect the wire to the correct solder pad. My goal is to secure both the wire and the connector so that I do not have to manually hold the wire in position as the joint cools. Any movement during that critical time could create a cold solder joint. I have the plug jig mounted in a 3rd-Hand. So I use one of the tool’s alligator clips to hold the wire in place. I add heat with the iron until the solder on both parts flows together. I then let the joint cool hands off. Use the heatshrink tubing to insulate the first solder joint before stripping and tinning the second wire. After the solder has cooled enough to avoid skin burns, you can slide the heatshrink tubing down over the joint. Make sure that the tubing covers the conductors completely and then shrink the tubing with a heat source. This tubing will provide a reasonable degree of electrical insulation while you solder the remaining wire. Now you may strip and tin the second wire. When that is complete, be sure that you thread the wire trough the snap-on cover. You could also add heatshrink tubing to this wire, but it isn’t really necessary. 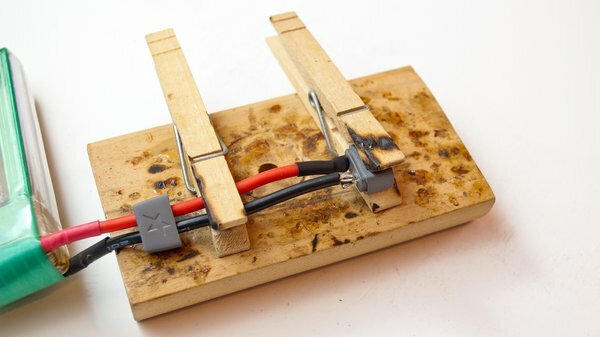 This is an old homemade jig that is great for soldering battery connectors. In this view, the parts have been aligned but not yet soldered together. Solder this wire to the remaining pad on the connector. Keep in mind that the tubing on the other terminal only the guards against incidental contact. So you still have to work carefully. If you accidentally let the tip of the soldering iron touch the tubing for more than a second or two, it would likely burn through and expose the solder joint. For illustration purposes, I connected the second wire to the Star Plug using an old homemade jig. It’s just a pair of wooden clothespins attached to a block of wood. It works as well as the aluminum jig/3rd-Hand combo for aligning and holding the parts. It just doesn’t have heatsink properties. As you can see from the burn marks, I’ve been using the wooden jig for years with a lot of success. The snap-on cover holds reasonably well, but it can pop loose when you’re trying to unplug a battery. To prevent this, I run a small bead of GOOP adhesive around the seating area of the cover. I think it’s easiest to drop a glob of GOOP on a scrap piece of cardboard and then apply it to the plug with a toothpick. Don’t worry about neatness at this point. The excess GOOP will ooze out when you snap the cover into place. You can wipe it away with your finger. Use a little denatured alcohol on a cloth if you’re a stickler for cleanliness. A thin bead of GOOP adhesive helps the snap-on cover stay in place more tenaciously. The GOOP will need a few hours to dry completely. Once it has set, it will help to hold the cover in place well. But you can still pry the cover off with a flat-tip screwdriver if you ever need to. As you can see, there is nothing terribly difficult about soldering battery connectors. Achieving success is a matter if identifying the risky areas and mitigating them. Before long, your safety-conscious approach will become second nature. The completed installation is clean, well-protected, and ready for action.